Jay Garrick has revealed himself to the STAR Labs team, telling a tall tale of how The Singularity was a portal to another Earth. An Earth where he is a hero called The Flash! And where a villain named Zoom seeks to destroy every other being in the universe with super-speed powers. Meanwhile, Joe West has sidelined his Metahuman Task Force as nobody was interested in joining it. Nobody, that is, except a rookie officer named Patty Spivot, who has a mind for science and her own reasons for fighting metahuman criminals. She'll get her chance sooner than she thinks, as Zoom recruits another villain from another world - Sand Demon - to kill The Flash and Spivot becomes an unwitting hostage. Just how did Jay Garrick get through STAR Labs new and improved security without the benefit of super speed powers? The face Carlos Valdes makes when he has a Vibe Vision just plain looks silly. For the second week in a row, Barry seems to semi-accidentally kill a super-villain! 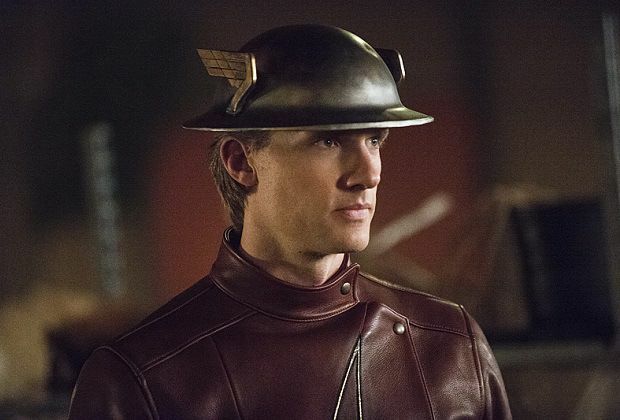 Teddy Sears all but steals the episode as Jay Garrick. Sears is reminiscent of a young Scott Bakula, playing the down-to-earth, intelligent man-of-action masterfully. His chemistry with Danielle Panabaker is quite good and the two of them play off of each other well enough to make some potentially embarrassing dialogue work. By the same token, Shantel VanSanten has similarly good chemistry with Grant Gustin during their brief moments flirting with one another. She also manages not to seem weak, needy or submissive once, despite spending most of the episode trying to get Joe to give her a job on his task force and being taken hostage purely so Barry has someone to rescue from Sand Demon in the final act. The special effects in this episode are top-notch - from Barry's first encounter with Sand Demon to his rescue of Patty Spivot near the end of the episode. The show opens with a new "My name is Barry Allen..." sequence to reflect the new season. The title of this episode is a reference to The Flash Vol. 1 #123 (September 1961), which was also titled Flash of Two Worlds. Zoom is the code-name used by the Flash villain Hunter Zolomon. However, this Zoom does not seem to bare any relation to that character as of yet. Zoom manifests blue lightning when he moves. This energy is reminiscent of the villain Cobalt Blue, who - in the comics - was Barry Allen's long-lost evil twin. The vision of Zoom we see in Jay's flashback (no pun intended) bares a slight resembelance to The Black Flash - a manifestation of The Speed Force that attempts to lure speedsters to their death in the comics. Jason "Jay" Garrick was the first superhero to be known as The Flash. First appearing in Flash Comics #1 (January 1940), Jay was a double-major in physics and chemistry as well as a college football star. He developed super-speed powers after a lab accident, knocking over his equipment as he was trying to purify hard water using a cyclotron to remove the residual radiation. The background of the DCTVU version of Jay Garrick seems to mirror that of his comics counterpart. He also has a background in chemistry and physics and he says he gained his powers in a lab accident that involved purifying hard water without leaving behind any residual radiation. Jay Garrick's distinctive helmet is a petasos. The petasos was originally a hat developed by the Ancient Greeks and was usually made of wool, felt, leather or straw. It was a precursor to the modern fedora, with its broad, floppy brim making it ideal for rural life as it protected both the back of the neck and shaded the eyes. Metal petasi were part of the uniform for the Athenian cavalry. A modified metal petasos with wings was the symbolic helmet of the Greek god Hermes - the messenger of the gods, who was said to be gifted with amazing speed thanks to a pair of winged sandals. It was for this reason that Jay Garrick adopted a metal winged petasos as part of his costume as The Flash. Jay Garrick's Flash went on to become one of the founding members of The Justice Society of America - the first superhero team in history. In Showcase #4 - the first comic Barry Allen appeared it - it was revealed that Barry Allen was a comic reader and that he took the name of The Flash in honor of his favorite superhero since he was a boy - a superhero who looked like the Jay Garrick version of The Flash! This incongruity - in an effort to answer fan questions as to whatever happened to Jay Garrick - was explained The Flash Vol. 1 #123 (September 1961). This comic had Barry Allen accidentally run so fast that he traveled between realities, winding up in the world where Jay Garrick was The Flash! It was explained that there were multiple Earths that occupied the same position in time and space but were separated by a fifth dimension that could be passed through by vibrating at a specific frequency. Coincidentally, this general description perfectly fits Hugh Everett's relative state formulation of quantum mechanics - a.k.a. The Many Worlds Interpretation. Everett published this paper just four years before The Flash Vol. 1 #123 came out. As far as we know writer Gardner Fox didn't read it! But Professor Stein cites the theory when attempting to explain what Jay Garrick has told them to Joe West. Professor Stein also mentions the idea of a multi-verse - multiple universes - which has been cited in both numerous DC Comic books to explain away the various alternate realities making up their comic line and by physicists. Professor Stein also labels Barry's Earth as Earth 1 and Jay Garrick's world as Earth 2. These are the exact designations used in the comics to label the respective Earths of Barry Allen and Jay Garrick. It was theorized that the writers on Earth 1 who wrote the comics featuring heroes from Earth 2 had a psychic gift to see between realities that caused them to envision the adventures of Jay Garrick and his friends as daydreams, which they transposed into comics. This is similar to the ability that Cisco has begun to manifest in the DCTVU. Patty Spivot is a character in The Flash comics. She was originally Barry Allen's lab assistant in the pre-Crisis comics and later became head of the Blood Analysis department of the Central City Police Department. In the New 52 Flash comics, she was Barry Allen's co-worker and girlfriend for a time. Apart from being an attractive blonde woman with an interest in science, the DCTVU version of Patty Spivot doesn't have much in common with any of her comic book counterparts. The DCTVU version is a beat cop turned detective who has no interest in working in a lab despite her scientific background (triple major in biology, chemistry and physics). The comics versions were scientists, through and through. Sand Demon was a minor villain and enemy of Firestorm, who first appeared in The Fury of Firestorm #51. A crooked wrestling manager known as Eddie Slick, one of his wrestlers - King Crusher - mutated into a giant monster. Firestorm saved the day but also exposed Slick's providing illegal steroids to his wrestlers. The Las Vegas gangsters Eddie worked for weren't pleased and buried him alive in the desert. It was here that Eddie developed an ability to meld with the earth around him and reshape it and himself. He later went on a rampage and was easily defeated by Firestorm after being transformed into glass and then broken. The DCTVU version of Sand Demon is also named Eddie Slick and has the exact same powers as his comic book counterpart, though we do not discover his background before he was recruited by Zoom. We do know that the Earth 1 version of Eddie Slick is a career criminal, like his comic book counterpart and the Earth 2 version has demolitions training. Cisco's visions in this episode seem to be a form of clairvoyance - the power to perceive information about an object, person, location or event through extrasensory perception. In this case, Cisco is able to see what Sand Demon was doing at early points in time just after he touched the sample of Sand Demon's cells. Joe notes that Iron Heights is now equipped to handle metahuman criminals. In the original comics, Iron Heights was a prison specifically built to handle metahuman criminals and many of The Flash's enemies were kept there. Earth 1 Eddie Slick claims that he was in Blackgate Penitentiary at the time of The Particle Accelerator explosion in December 2013. In the comics, Blackgate Penitentiary is the largest prison in Gotham City and where most of the non-insane and non-powered enemies of Batman are locked up. Both Barry and Patty are Monty Python fans and make reference to The Bridge Keeper from Monty Python and The Holy Grail. Perhaps not coincidentally, this episode originally aired on the 40th anniversary of the release of that movie, on the same day that a special edition was rereleased in theaters. Sand Demon makes his hideout in the abandoned Woodrue Grow House. This is likely a reference to Jason Woodrue - a scientist who later became the half-man/half-plant super-villain known as The Floronic Man. Jay teaches Barry a new trick - how to harness his speed to create targeted electrical bursts, effectively generating ball lightning and throwing lightning bolts. This is a power that The Flash has used before in the comics. The DCTVU version of Sand Demon is defeated in the same manner as his comic book counterpart, with Barry transforming him into glass with a controlled lightning strike and shattering him. Sand Demon is a fairly obvious rip-off of The Sandman - a Spider-Man villain created by Stan Lee and Steve Ditko. The scene where Patty calls out for The Flash, both Barry and Jay yell "Coming! ", and they run to her along opposite sides of a brick wall is a visual reference to the cover of The Flash #123. Jay and Barry compare their respective nicknames - The Scarlet Speedster and The Crimson Comet. These were indeed the alliterative nicknames they were given in their respective comics. Cisco drops the name of his comic-book counterpart's superhero identity, talking about the "vibe" that he gets before having a vision of something that happened in the past. Professor Stein and Cisco detect 52 separate breaches in Central City. This is yet another nod to the significance of the number 52 in the DC Comics Universe. In a nod to the comics, Jay Garrick he says he gained his powers in a lab accident that involved purifying hard water without leaving behind any residual radiation. Professor Stein cites Hugh Everett's relative state formulation of quantum mechanics - a.k.a. The Many Worlds Interpretation when attempting to explain the ideal of parallel universes and multiple Earths to Joe West. Caitlin determines that Jay Garrick's heart rate and blood pressure are both lower than normal, the oxygen levels in his blood are impressive and that he does have regenerative capabilities but there's no other evidence of The Speed Force in his system. She also measured his autonomic reactions while asking him about his past - i.e. giving him a lie detector test - and determined he was telling the truth about being from another Earth. Barry notes that the walls of the building Sand Demon first confronted him is too porous to take fingerprints from. Barry determines the fire in the building where he first fought Sand Demon was caused by arson, based on the random gasoline burns as well as the fact that the sprinkler system did not go off. Patty Spivot determines that the fire was started by someone cutting through a gas pipe using a sand-blaster. She theorizes, however, that a metahuman was responsible since there's no commercial sand-blaster that she knows of that is capable of such precision. She also takes fingerprint samples off the pipe and a sample of the sand left behind. Jay Garrick identifies the "sand" that Sand Demon transforms into as human cells whose myosin II protein have emigrated into the cell's periphery. These cells have the ability to rearrange and harden, given them the appearance of sand. Professor Stein theorizes that they can detect the breaches caused by The Singularity through tracking exotic matter or trans-dimensional energy. Theoretically, this energy should leak from one universe to the other. This means that they can use an electro-photography program and the STAR Labs satellite to take pictures of the whole city and locate the breaches. The Earth 1 Eddie Slick says he prefers using substances that are hard to trace like acetone to set a fire. Sand Demon requires exposure to high humidity in order to maintain his composure. This requires him to make his hideouts in greenhouses or grow rooms. Failure to stay hydrated will cause his body to dry out and collapse, like dry sand. Jay's plan to stop Sand Demon depends upon Barry focusing the electrical energy he generates when he runs and focusing it into a bolt that will fuse Sand Demon into glass, like lightning striking a beach. Sand Demon constructs a concussive bomb as a distraction, as his body can absorb the force of the blast whereas The Flash would be affected normally despite his speed. Professor Stein describes the "breaches" as pockets of time and space folded into and upon themselves. Barry: My name is Barry Allen and I'm the fastest man alive! To the outside world, I'm an ordinary forensic scientist. But secretly, with the help of my friends at STAR Labs, I fight crime and find other metahumans like me. I hunted down the man who killed my mother but in doing so I opened up our world to new threats. And I am the only one fast enough to stop them. I am The Flash! Barry: Okay, so... Jay? How exactly do you know all of this? Jay: Where I came from, I was a speedster like you. They called me The Flash. Jay: Look, Barry I don't what else I can do to prove to you I'm on your side. I've been poked, prodded - I even subjected myself to a full body scan! Caitlin: (defensively) I was being thorough! Iris: What has happened to you? Barry: Are you - me? Iris: Yes, you. The you that I grew up with. The you that is my best friend. The you that became The Flash. I haven't seen that you in a very long time. Barry: A lot has changed, Iris. Iris: Yeah, it sure has. You have learned how to not trust people. What is it about Jay that you don't like? (pauses) It's because he reminds you of Harrison Wells. Barry: I trusted that man. For months. We all did. (pauses) And you know what? Eddie is dead. Ronnie is dead. And a whole lot of other people in this city? They are dead. Because we trusted him. I'm not going to let us make that mistake again. Iris: Barry, not everyone is Harrison Wells. Besides, you defeated him because you trusted in people. Because you believed in them. This team that you have here? They will follow your lead. They will do what you say. But if they think that you don't believe in them, it won't be long before they don't believe in you. Sand Demon: Is that you, Flash? Found your way here? Jay: I came quite a distance. Sand Demon: Quite a bit slower on this Earth, aren't you, Flash? Jay: This is a lot harder than I thought. Losing something that was such a big part of who I was for so long. Caitlin: I lost something that was a part of me too. It's hard. But it gets easier every day. You just have to find a new way to live. (pauses) Just because it's a different life doesn't mean its a worse one. And, speed or no speed, in my book you were still a hero today. Jay: What is it with alliteration and nicknames? Patty: Two murderers got super powers. So, that's why I'm here, sir. That's why I'm so hell-bent on being on your task force. Because there's some bad people out there and they can do... anything. And I may not have powers, but I want to stop them. And you're the only person I know who wants to do that too. Cisco: Something's happening to me. I'm starting to perceive things. Horrible things. It started after Wells killed me in the other timeline. It came back when Atom Smasher attacked on Flash Day. And then again when Sand Demon showed up. I get a vibe... and then a vision of something that already happened... and then it's gone. That's how I knew where Slick was. Cisco: No, no, no! We're not doing any of that and we're certainly not telling anybody, either! Stein: Cisco, I would think you would be the one most intrigued with knowing exactly what this is and how it works! Cisco: I'm seeing things I don't want to see and knowing things I don't want to know! I just want it to stop! Professor, I don't want anyone to know about this. Not yet. Stein: It's okay to be afraid, you know. Cisco: Wells told me this was in my future. That he gave me this power. But everything he did was evil. That's what scares me, Professor. You have to promise me... you won't tell anyone about this. It is revealed that the dead Al Rothstein from 201 was the Earth 1 version of Al Rothstein and that Atom Smasher was the Earth 2 version of Al Rothstein. Jay reveals that he has been trapped on Earth 1 and powerless for six months, since The Singularity opened. Jay has been The Flash for about two years on his world, yet he seems to be far more experienced than Barry and has manifested powers Barry hasn't, such as the ability to throw lightning bolts. He was also much faster than Barry, being capable of almost reaching the speed of light. Patty Spigot has been with the CCPD for seven months. She was a triple major at Hudson University (biology, chemistry and physics), is in peak physical condition and she rated at the top of her class in marksmanship. Barry extinguishes the fire that Sand Demon started using the vaccum-generation trick he mastered back in 120. Joe notes that Iron Heights - the large prison between Central City and Star City - is now equipped to handle metahumans. This episode takes place one day after The Green Arrow first announced himself to the people of Star City in A401. Jay Garrick says that the helmet from his costume belonged to his father, who wore it when he fought in the War of the Americas. Jay Garrick says that Zoom first appeared shortly after he got his speed powers and that he killed a lot of people on Earth 2. Garrick says it took him two years to track Zoom down. He claims Zoom is obsessed with destroying him and that he is determined to make sure he is the only speedster in any world. Patty Spigot's father was killed by Mark Mardon -a.k.a. The Weather Wizard. Her father ran a shoe shop and was killed during one of The Mardon Brothers' bank robberies several months before they got super powers. She says she wants to join Joe's taskforce not out of revenge but because someone has to stop the bad metahumans and Joe is the only person who seems interested in doing so. Patty Spigot is promoted to Detective and joins Joe's taskforce as his partner. Joe West's wife is revealed to not be dead, though she is not named in this episode. Cisco refers to his previous visions from 120 and 201. Cisco tells Professor Stein about his newfound power. Stein agrees to keep Cisco's secret. Professor Stein and Cisco detect 52 separate breaches around Central City, with the largest one being located within STAR Labs. Stein is about to describe what lies beyond that breach before he collapses. The end-of-episode stinger gives us a vision of what seems to be an alternate version of Central City. Here, we see a school group touring STAR Labs, which we are told was founded in 1991 and specializes in artificial intelligence, genetics and metahuman studies. It has the motto "Bringing You Tomorrow's World Today" and was founded by Harrison Wells, who is introduced to the students as the Savior of Central City. We see a scene on Jay Garrick's Earth in his unnamed home town, where he fights Zoom before being sucked through The Singularity. The end-of-show stinger seems to take place on yet another alternate Earth, where Harrison Wells is a respected scientist and is described as the Savior of Central City. An intriguing episode where the quality of writing shows in the research and the world-building rather than the dialogue. Still, the new cast prove themselves worthy of joining the ensemble and the special effects work in the action sequences is some of the best yet. The last ten minutes make this episode truly magical.